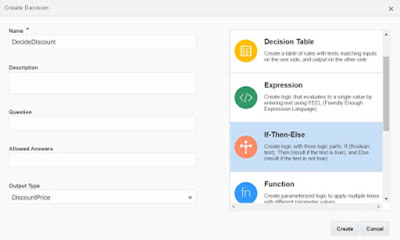 In my previous blog, I showed how to get started with Decision Model Notation (DMN) in Oracle Process Cloud Service and how to create a simple Decision Table. Picking up from there, we will now look into creating If-Then-Else rules, which should also be familiar to people who know Oracle’s old Business Rules. We will also create a service and call it from a process. As Input, I have created a TotalAmount object, which is the total amount of a Sales Order. Based on this TotalAmount, we are going to calculate a Discount Price, for which I have created a DiscountPrice type to make the service interface a bit prettier than just ‘output’. To create an If-Then-Else rule, just click the + button next to Decisions, enter a name and set the output type to string, number or any other type, in this case DiscountPrice. Now, Oracle will have created a rule for you, in which you only need to fill in the "if", "then" and "else". Since you’ve already decided your output object, we will not use that one in the expression, which is different from the old Oracle Business Rules. So just enter the value that you want for this object and you’ll be fine. You can also create nested expressions, as shown below: Read the complete article here.